I was flipping through Lars Bo Hansen’s book Improve Your Chess the other day – I haven’t played in 11 months now and I haven’t seriously studied in about as long, but I still enjoy flipping reading a chess book now and then – when I came across an example from page 96 of the book. The game is Larsen – Gheorghiu, Palma de Mallorca 1968. 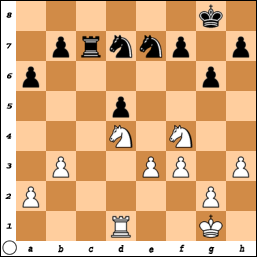 Hansen gives the game as an example of how to play against Isolated Queen’s Pawns, but for me, the interesting part starts here. I’ve been a bit lazy about blogging recently, but one ChessBase article from a day ago was worth a mention. ChessBase hasn’t been particularly good with regards to chess news for some time in my view, but every once in a while, they still manage to get a good annotator for their games. The latest example of the new normal – poor annotations – is from their article about round 1 at the World Team Championships involving the game between GM Alexander Areshchenko and IM Samy Shoker. 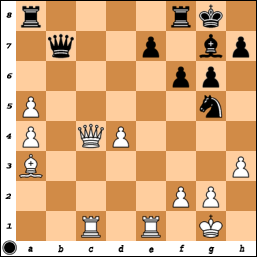 “Instead of taking an easy win with 23.Qg7 GM Alexander Areshchenko, rated 2682, blundered with 23.e5?? Playing through a few of the top boards from each round at the World Open, there were a few games that caught my eye. First up, Adams – Ehlvest, from round 4. Ehlvest had just sacrificed a pawn on a5 (16…a5 17.bxa5 Bg4), and probably was banking on some loose pieces in White’s camp to recover it. It does look like the Nc4 is a bit overloaded, having to watch over the Bb2 and the pawn on a5, while the pin from the Bg4 might also be annoying with …Ng5 on tap. White seems to have gotten himself in a bit of a pickle here, as the overloaded knight is now under attack. White’s next of 21.a4 makes some sense, but after 21…Qb7, it still looks like trouble – the knight is safe for the time being, but …Ng5 ends the pin on the d5-pawn, and playing 22.h4 is too slow because then Black just needs to guard his queen (with 22…Rfb8 for example), and then both minors are hanging. So what to do? Adams uncorked the brilliant 22.Ba3! 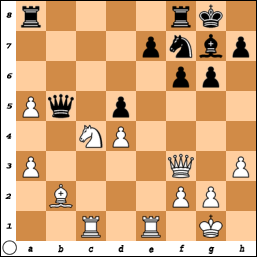 at this point (although the whole idea had to seen with 18.h3), seemingly ignoring the threat to his knight. 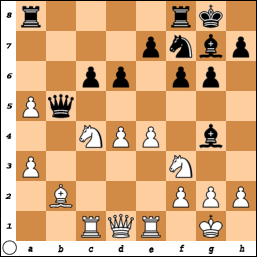 After 22…Ng5 23.Qe2, the main line must be to take the knight, but Ehlvest found it didn’t work and played 23…Re8 instead. 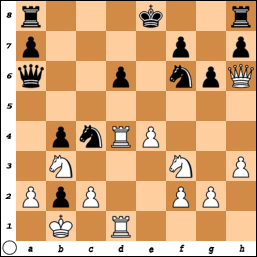 After 24.Rb1 Qa6 25.Nb6, White emerged a pawn up in the endgame and won without too much more trouble. But what happens if Black takes the knight?